Based on reviews from 206 experts and 19,547 users. Learn how our rankings work or see our guide to black football boots. Updated Apr 2019. 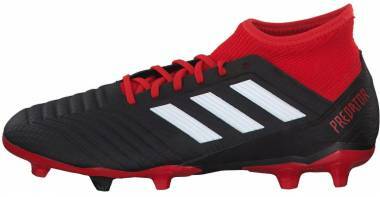 Black is one of the most preferred colors for a football boot. It only does not denote strong features, but it also represents a pure, no-nonsense boot personality. It signifies various meanings, and interestingly, several infamous connotations have been affixed to the bold color, even in the football world. Football boots have gone through a whirlwind of revolution when it comes to the usage of colors. Soccer shoes are claimed to have been black from the 1930’s until the 70’s. From the 1970’s onwards, football boots have never been just single-colored. Getting to know football cleats in its purest and oldest palette will give us an idea on how this mysterious hue made an impact on the football world. 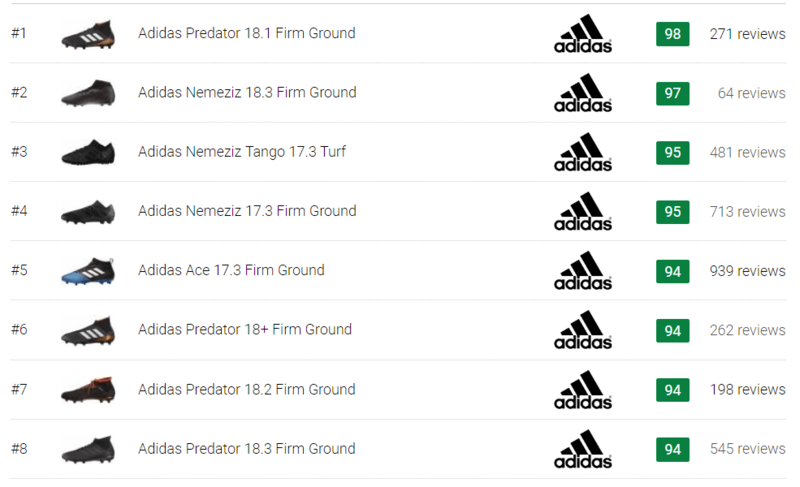 Below is a list of black football boots or boot collections coming from recognized international brands including Nike, Adidas, Puma, New Balance, Under Armour, Umbro, Mizuno, and Diadora. Some of the boots in the list are limited or special edition cleats. Nike Pitch Dark Pack - This unique blackout rendition was originally distributed in 2016 headlined by three of Nike’s lineup: Nike Mercurial, Tiempo, and Hypervenom. It featured a jet black colorway with a highlight of electric bolt colors in the trademark Swoosh. A year after, the color range was upgraded to a more subtle white Swoosh, with the addition of the Nike Magista lineup. 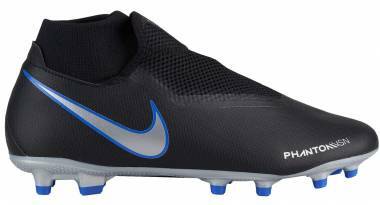 Nike Stealth Pack - Nike launched the Stealth Pack in 2014 featuring the blackout boots from all four lines of the Nike cleats. The white outlined Swoosh and the colored edges of the shoes are the two main focal points of the color range. The collared boots Nike Magista Obra and Mercurial Superfly IV are accentuated with the “Hyperpunch” hue while the low-cut boots Tiempo Legend V and Nike Hypervenom Phantom III has Volt heel liners. Nike Tech Craft Pack - Released in August of 2017, the Tech Craft Pack advertised three of the Nike low-top boots, Magista Opus II, Hypervenom Phantom III and Mercurial Vapor XI. The black football boots are elegantly wrapped in leather, almost identical to the Tiempo line. The upper construction of the boots showcases the fusion of Flyknit and leather. The range was eventually made available in all cleated and FootballX versions. Nike Flyknit Ultra Play Ice - The Ultra Play Ice is a limited edition Gamma Blue -Black Mercurial Superfly V boot. The Italian flag is designed in the heel in honor of the Montebelluna facility where Flyknit was first developed. To represent the “Ice” vibe, the soleplate and the Swoosh outline reflect a soothing blue chrome. Nike Flyknit Ultra Play Fire - A black Flyknit upper with a university red plate makes up the blueprint of the Ultra Play Fire color pack. The black football boot was built with the same inspiration as the Ultra Play Ice which is to commemorate the first facility that created the revolutionary FlyKnit. The firm ground boot was originally headlined by the Brazilian forward Neymar Jr.
Nike Flyknit Ultra Laser Orange - The very first Mercurial Vapor boot with a Flyknit upper was publicized in the Ultra Laser Orange limited edition pack. Only 1500 pairs were made available worldwide. Similar to the other Ultra kits, the firm ground boot has a dominantly black upper and Swoosh outline. Nike Flyknit Ultra Stealth - The Mercurial Superfly V boot was genuinely turned into a blackout football boot in this no-nonsense color pack. The all black boot is fashioned with a Flyknit upper with a central lacing system. A black outlined Swoosh is almost camouflaged to the black lateral side and complements the metallic-silver hyper-reactive Plate. Nike Academy Pack - The simple black layout of the Academy pack is literally built for the players of the elite Nike Academy. Building from that inspiration, the designers created a model suited for all football players of any level. It is composed of four Nike firm ground boots, each one coming from the four major lineups. The football boots are stained with a straightforward black accented with a subtle volt in the transparent studs. Nike 10R Paris - To commemorate Ronaldinho's historic soccer achievements, the 10R Paris boot was created as a part of the 10R City collection. The indoor boot showcases a black quilted leather upper mapped with symbols personally meaningful for the Brazilian footballer. Among those figurative designs is the red, orange and yellow stitching in the heel which represents family, music, and joy. 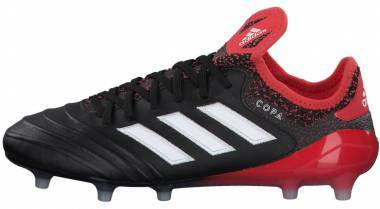 Adidas Cold-Blooded Pack - The Adidas Copa 18.1 of the Cold Blooded pack is the only football boot in the lineup stained in a notably black hue. 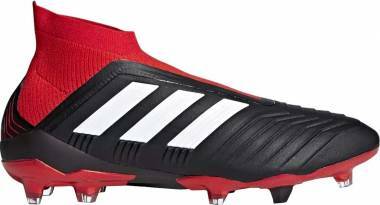 Pigments of black and red make up the heel area while the signature white Adidas stripes contrast the dark upper on the lateral side. Instead of the classic leather stitching, an internal skeleton structure forms the textured lines on the forefoot. The heel and tongue, on the other hand, is made of Knit material. 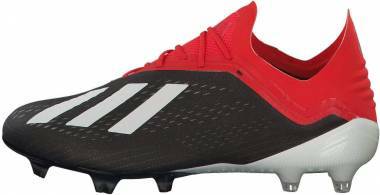 Adidas Magnetic Storm Pack - The boot palette is a touch of matte black upper and iridescent stripes in three of the popular boots of Adidas including the Nemeziz 17+ 360 Agility, Ace 17+ Purecontrol, and X17+ Purespeed. The core black silhouette is a limited edition that was made public in 2017. Adidas Skystalker Pack - The Adidas Predator 18+ FG debuted in the Skystalker layout in black, red and gold metallic colors. The colorway is reminiscent of the iconic Predator boots which initially came out in 1994. The Adidas Copa 18 and X17+ Purespeed boots are the other two boots that were launched in the same colorway but is presented in white and metallic gold upper, respectively. Adidas Enlightened Pack - This glow-in-the-dark limited edition was made public in 2013. 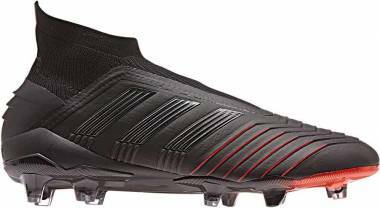 It was featured in the Predator LZ, F50 Adizero FG and the Adipure 11 Pro boots. The reflective white stripes in a black upper are the main highlights of the colorway. 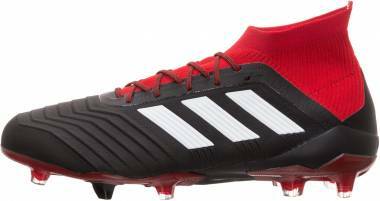 Adidas Instinct Black pack - The black football boot colorway is inspired by an 18th-century knight armor. Intricate Middle Ages pattern is embossed in the heel area while the tongue is wrapped in a shiny gloss to mimic the armor reflection. The Predator boot was launched in this colorway in 2015. Adidas Checkered Black Pack - Three of the Adidas boots are the main models of this silhouette, released in 2017 namely the Ace 17+ Purecontrol, X16 and Copa 17.1. 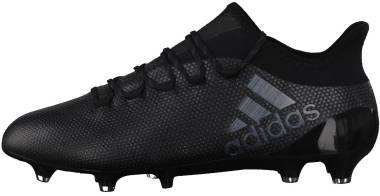 The black football boots are patterned with a subtle checkered print in the upper. For the Copa boot, a subtle hint of checkered and red print is placed in the heel area for a more traditional look. Adidas Dark Space Pack - This colorway features boots from the Ace and X series in a pitch black tone and reflective branding. The Dark Space Pack was issued in 2016 as a limited edition choice. The black football boots initially advertised in this colorway is the Ace 16+ Purecontrol and X 16+ Purechaos. For Puma, less is more. Unlike the Adidas and Nike, Puma present their football boots in straightforward color options. They offer black football boots across all their lineups and boot types, usually paired with the following accent colors: Silver, Fiery Coral, Bronze, White, Yellow, Red, and Gold. Puma football boots such as the Invicto Fresh, One 17.1 FG, EvoSpeed 4.5 Graphic FG and One 17.4 FG were all made available in different color options including black while some boots such as the EvoPower 3.3 Turf and One Chrome Firm Ground can only be purchased in certain color options excluding black. Super Atom Limited Edition - To commemorate Puma’s 65th anniversary and the groundbreaking invention of the first ever screw-in stud, the “Super Atom” was released as a limited edition boot. The upper is designed in classic black leather with a high top silhouette. The blueprint is almost identical to the original boot with slight touches of modern features. Puma King SL Classico Limited Edition - The black King SL Classico boot was launched in 2014 to mark Puma’s 65th year as an industry. Dubbed as “SL” which means super lightweight, the speed boot impressively weighed 6.02oz in a leather upper. King Maradona Super - The King Maradona Super boot was a comeback boot in honor of the iconic Diego Maradona and his “goal of the century” which happened in 1986. The black football boot is styled with the trademark white formstrip and a printed portrait of the Argentine footballer on the tongue. Puma King Lux - This boot is the most limited boot ever released by Puma as only 99 pairs were made available. The King Lux is a black football boot made from leather launched in 2013. It is by far the most expensive Puma boot due to the 24-carat gold flakes in the heel. It is priced at $450 a pair with a matching premium leather boot bag. New Balance Visaro 2.0 Pro FG - The New Balance Visaro 2.0 Pro firm ground boot is advertised in an Energy Lime edition but is also available as a black football boot. The only contrast element on the shoe is the white “N” branding of New Balance found on the lateral side. Its moccasin leather construction in black exudes a quintessential heritage vibe. New Balance MiUK One - Only 2000 pairs of the MiUK boot were made available in 2016. This limited edition leather boot which means “Made in the UK”, was the first boot manufactured in the New Balance facility in Flimby. The black football boot features a “Made in England” logo and flap tongue. A boot bag containing a boot polish and brush is also included in this exclusive package. New Balance Furon Black Java - The Black Java is a mixture of black and orange in the original New Balance Furon. Professional footballers Jesus Navas and Alvaro Negredo headlined the color way in 2015. The branding and half of the soleplate are colored in Impulse orange while the rest of the boot is in black. Under Armour Command Indoor - The Under Armour Command Indoor boot is offered in both blackout and whiteout color options. Its black upper version is paired with a Vapor Green rubber outsole. It has a Kangaroo leather upper construction with quilted lateral and medial sides. Under Armour Clutchfit 3.0 3D - This black football boot is built with a biomechanically tested 3D texture in the upper to enhance ball touch. It is meant to offer a barefoot sensation with its embossed geometrical flexes. The boot is available in a non-3D version with the same colorway. Mizuno Rebula - From the original to the third version of Mizuno Rebula, this firm ground boot has always been publicized in a black colorway, usually as the base color. It is a boot with a Kangaroo leather upper construction engineered for better ball control. Its first edition was launched in 2017. Mizuno Morelia II MIJ - The Mizuno Morelia II “Made in Japan” football boot was released in a black-silver color edition in January 2018. The quality of the Kangaroo leather upper is almost identical to the first version of the Rebula. The boot has been known for its lightweight quality, weighing 6.34 ounces. Umbro Calibra - Umbro’s first ever high top football boot was headlined in a signature black colorway and was named “Calibra”. The ankle collar is made of neoprene while its upper construction is pure leather. Both the collar and the upper are black with a subtle hint of neon green in the studs and the Umbro branding. Umbro Speciali Eternal Pro Hard Ground - The Speciali Eternal Pro is a comeback of a heritage cleat that was worn by legendary soccer icons such as Pepe and Alan Shearer. It is featured in a dominantly black leather upper with white Umbro branding on the lateral side. Diadora Brasil Italy OG - A remake of 1984 heritage boot, Diadora Brasil OG exemplifies a traditional leather upper in a blackout palette. The black football boot was made public in 2017 as one of Diadora’s Brasil collection which includes the iconic Diadora Brasil Classic. As the name suggests, a boot is considered blackout if it is dominantly black, with almost no other color attached to it. It is done to intentionally conceal the boot’s character including its brand and features. If your favorite player wears a blackout boot, you have to know that it is more than just a fashion statement. They are testing a prototype football boot. If a famous professional player such as Messi or Neymar is sporting a blackout boot in a practice session, this is most likely because they have been tasked to test a prototype boot that is yet to be issued. In this way, big companies such as Nike and Adidas will be able to receive valuable feedback from the more experienced and successful pros. In 2016, Messi was seen trying out a black football boot in his training practice. It turns out, he was mysteriously testing out an Adidas prototype of Messi PureAgility Chaos. The boot was described having traditional central laces and a textured upper. Neymar was also spotted having black football boots in one of his training sessions in 2017. There were speculations that the Brazilian forward was wearing the latest model for a low-cut Nike Mercurial boots. They wear black football boots as part of the contract. If a professional player ends sponsorship with a boot supplier, he should wear black football boots as part of the contract guidelines. It signifies that the player may actually end up switching to a different company or putting offers on hold. There is also a possibility that the player has not received any deals just yet. The boots need to be concealed in a pitch black hue as the players no longer represent their previous sponsorship. A football boot expert may be able to spot the boot model and even the tech specs through pictures and close contact with the boot, but the average consumers may remain clueless. The Juventus forward Paulo Dybala became a trending topic in social media when he was captured wearing black football boots fashioned with his signature logo on the heel. It happened when his contract with Nike got expired, and no current deals with other sponsors were on hand. Soon after that, he was signed up with Adidas and headlined the X17+ Purespeed FG. The Spanish footballer Sergio Ramos also had the same ordeal when he was seen sporting a spray painted black football boots in 2016. His contract with Nike just ended, and he was struggling to find another sponsor because of his high wage demands. Later that year, he signed a two-million deal with the same company. Colored boots are not fitting for new players. A few years ago, wearing black football boots became infamous when the Scottish football manager Sir Alex Ferguson took a stand against colored boots. For him, Manchester junior players need to earn the right to strut those bright colored boots on the pitch. He’d rather let them wear black football boots or else get singled out. The junior players were only allowed to wear black football boots while they are still under contract with the club. A rookie player with a bright colored cleat was deemed to be a bad combination even for Queens Park Ranger Coach Marc Bircham. Just like Ferguson, he feels that colored boots are not fitting for new players because it is just too “flashy” for them. Black football boots are easy to maintain. 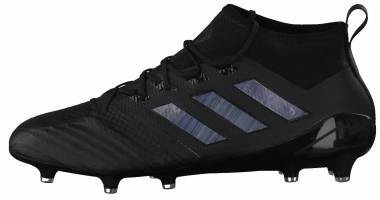 Black football boots are definitely easy to manage and maintain due to its dark hue that can conceal dirt in all types of playing surface. Even the soft muddy ground can camouflage the deceiving color. In comparison to white football boots, the cleaning process for a black cleat is not as tedious. Black football boots are symbolic. Wearing a black football boot is a symbolic act of paying tribute to the legendary soccer players whose epic goals have made an impact in the soccer world. Most of these players wore black cleats while scoring victorious goals for their team and their country. For instance, the black Puma King Maradona Super was inspired by the epic goal of Diego Maradona who impressively got past six England players including the goalkeeper in pursuing his “goal of the century”. Another example of a black tribute boot is the Nike 10R Paris which was co-designed by one of the icons in the modern football, Ronaldinho. It was launched just in time for his unexpected retirement in January 2018. Black is a popular color in all sorts of things. It can be considered as universal due to its superb blending quality. 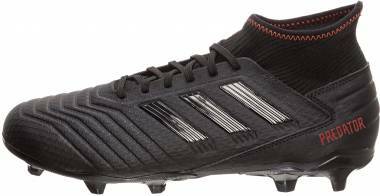 It is particularly true to black football boots as well, because they can be matched to any jersey or sock color. If you are fashion-conscious, wearing black cleats would be the safest option to avoid any mismatch. Black football boots never go out of style. Major design elements are usually hidden in dark chrome, and outdated features will barely get detected. Wearing one will not force players to fit in to the trend. With this, it can give players an additional benefit of saving money and not having to buy a new pair. What is a DIY blackout boot? Contrastingly, wearing a black football boot is a special privilege to an average consumer. 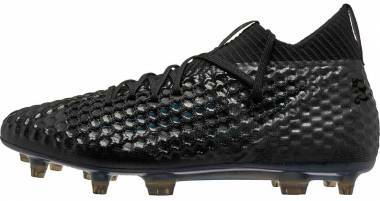 Blackout cleats are rarely released,and if they are, only a few pairs will be made available. Due to this, a lot of football players are enticed to “black out” their football boots with some DIY (Do-It-Yourself) techniques. It is worth noting that any alteration to the boot will demerit the warranty which is the downside to this creative trick. Players or artists may transform cleats into black football boots in several ways. Some opt to use ready-made boot dyes while some prefer to use spray paint. Both methods will produce identical results, but boot dye kits normally come with a preparer that can wash out stubborn plastic layers in the boot that may interfere with the dye. A packing or masking tape is often used to cover areas that do not need to be blacked out while a washout spray or a finisher liquid that prevents the dye from washing off. With all these materials handy and a careful artistic hand, the bright colored boot can be transformed to a stealth-like finish. Why is Cristiano Ronaldo not wearing black football boots? Cristiano Ronaldo never had any interest in black football boots. He thinks that black looks “slow”. The Portuguese player wanted to feel “fast” while wearing his cleat. It has also been proven through science that the color of a boot may trigger certain brain activities for a player, according to Nike’s Vice President Max Blau in defense of Ronaldo’s aversion for black boots. For Cristiano Ronaldo, wearing colored boots other than black gives him more confidence. Are Black football boots expensive? The color of the boot is not necessarily an indicator of its value. As a general rule, the more technology a shoe has, the more valuable it becomes. 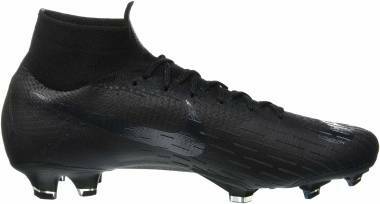 As for black football boots, it only becomes expensive if it is a special or limited edition cleat. Are indoor and turf boots available in blackout versions as well? Yes, even indoor and turf boots have blackout color options. It is worth noting that all-black renditions that do not have any accent color are rare to find in indoor and turf such as the blackout Ace Tango 17.3 Turf. The indoor boots, for instance, usually have brown rubber outsoles that keep the shoe in two tones. 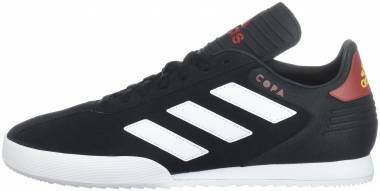 Even the dominantly black Copa Tango 17.1 Turf has a touch of white with its Boost midsole. Does Nike or Adidas offer black football boots for women? Yes. Both Nike and Adidas offer black football cleats for women. For Nike, the Tiempo and Hypervenom in the Light Aqua pack are two of the boots that has a dominantly black upper. Just in time for the European Championships, Nike released this black and light aqua colorway. Furthermore, Nike offers black color options across all boot types and models in their women’s pack. 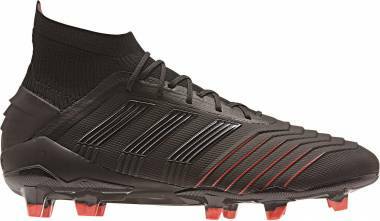 Adidas Messi 15.2 FG and Nemeziz 17.3 FG are two of the Adidas women’s boots that are available in a black colorway.